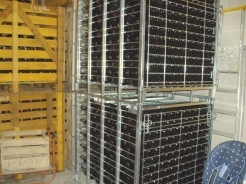 Back at ‘the ranch’, the wine is stored in huge tanks until it is blended and bottled and put into crates. The bottles are capped with a beer-bottle type lid. They are slowly turned by machine to collect the ‘debris’ until they are upside down. 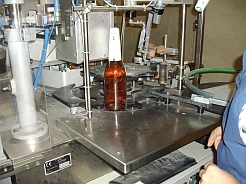 The non-standard bottles which they use for superior grade champagne have to be turned by hand. Removing the ‘waste’ is done by a peripatetic firm. They freeze the neck so that the unwanted lees are ‘blown out’ and after adding liqueur to produce brut or demi-sec the bottles are capped with traditional champagne corks. Labelling is done by a strange looking machine that puts on the ‘hat’ and ‘etiquette’. However, they must also add a top to each bottle to prove that tax has been paid before they can sell it. Apparently, if you are stopped by the customs or police and you have ‘untaxed wine’ in your car you are liable for a heavy fine and so is the producer who sold – or gave it to you. The champagne that we were offered for a tasting was a different matter. It had no label whatsover. It remined me of the champagne we drank at a gite years ago. The owner explained that provided we consumed it on the premises we could buy it for 8 euros a bottle but if we wanted to take it away it would have to be properly labelled and would cost 11 euros. We bought a couple of cases and Daniel’s sister-in-law kindly offered us another bottle as a present. 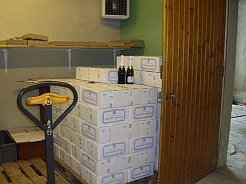 He loaded up his boot with more cases as he runs a (perfectly legal) depot du vin, which is where we normally buy our champagne. The journey home was most enjoyable despite meeting the rush hour traffic from Reims. Autumn colours were beginning to appear on the trees and were enhanced by the sunshine in a pale blue cloudless sky. Daniel kindly pulled off the motorway so that we could say hello to Woinic and take a photo. 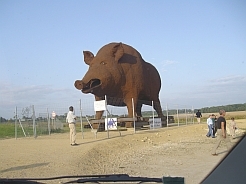 The giant boar already looks a bit rusty and isn’t exactly attractive but we were not alone in paying a visit. P.S. According to today’s paper (30th September) the growers are delighted with this years’s harvest. The quantity may not be exceptional but the quality compares well with the best vintages of the past. They will be able to check the flavours when they taste the first results in a few weeks time. Daniel was only half an hour late picking us up and his driving was not nearly as erratic as I’d feared. However, Bear insisted on sitting in the back to reduce his stress levels (he hates being driven). Our driver pointed out interesting landmarks en route and when we arrived in the champagne villages he took us on a tour of the vineyards. First he showed us the newly planted vines which wouldn’t produce grapes for three years. He explained that his wife and her brother owned ‘parcelles’ in various places. The best were on the higher ground as they were less likely to be affected by frost. Picking had started last week (the 16th) and was due to finish next Wednesday. Most of their pickers were students from the dental school at Reims. A few were provided with beds but all 10 of them were fed three meals a day. We found them in another vinyard , beavering away. It was surprising to find white (unripe grapes) above the red ones but Daniel said this was a sign of a good harvest next year. If there was no frost they could pick these grapes before Christmas. 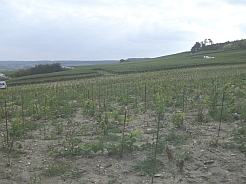 The vines are cut back every year leaving just the main branch with 7 or 8 shoots and a secondary branch, also with 7 or 8 shoots. Each plant produces about 3kilos of grapes – enough to make two bottles of champagne. 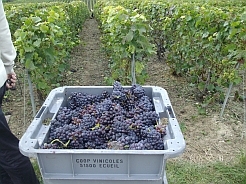 The pickers fill baskets and tip the contents into crates. Another worker brings two crates at a time to the edge of the field where they are collected by a tractor and taken to the co-operative. 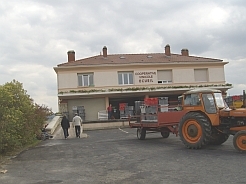 About 70 growers send their grapes to be pressed here. Some producers still press their own but , despite first appearances, it seems that working together is the best option. Everyone benefits from the best grapes and a state of the art pressing procedure, but the resulting champagnes are not identical because each producer blends his share of the juice (from three grape varieties) in his own way. 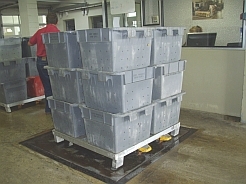 The crates arrive by tractor and are weighed and labelled before going to a waiting area to be pressed. They are poured into one of the ‘pressoirs’ for three pressings. The first produces the ‘cru’ or best juice and then the grapes are squashed again and a third time to produce T1 and T2 qualities. It was interesting to learn that the producers used the ‘cru’ themselves and sold the other two pressings to make poorer quality champagne (the sort you buy for 25 euros in supermarkets), or white wine. 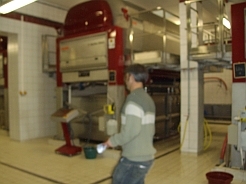 The remains of the grapeskins are not thrown away, they go to produce chemical alcohol, animal feed – or Marc de Champagne! The resulting juice is filtered twice and stored in huge tanks in a wonderfully clean underground room until it is redistributed to the producers. We were given a taste of the ‘finished juice’ and although Daniel warned us it wasn’t very nice I found it quite refreshing. Wow, is it really over ten days since my last post? Unfortunately I haven’t anything exciting to report but as LOM was kind enough to miss me I’ll give yu a brief update. The new member of the family, Willow, is settling in very well. We’ve never met such a self-confident little cat. She’s not afraid of the others – except for Holly – and is now chasing them round the house when she wants to play. She’ll try eating anything; for example she sampled toasted waffles dipped in hot chocolate this morning! We are so pleased she came to live with us. The cat-fence is progressing s l o w l y. We found a neighbour and his friend to undertake the job and, so far, since Monday 15th September they have put in four morning’s work. It’s amazing how many funerals Sylvain has had to attend and Thierry has lots of Doctors’ appointments. With a half erected fence I’m really worried about letting the cats out at all. Last week Holly was really upset because she had gone next door (to the left), come back over the roof and then found a high fence where she used to be able to jump over (from the right) She mewed pitifully and we cajoled for the best part of an hour before she finally took a gigantic leap, clawed her way up the wooden post on the neighbour’s side and jumped down into our garden. The fence is now three quarters of the way round the garden with just the ‘tricky’ bit on the slope to finish. Hopefully the cats will be able to play out by this weekend. . . . . .
Apart from that the tme has been taken up with doctor’s appointments for everyone with me going to all of them as interpreter. My own visits were for the weekly injections in my knee – two down and one to go next Monday. They are not too painful but the big disadvantage is that I’m supposed to ‘rest’ until the Wednesday. Huh! 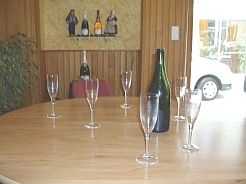 Tomorrow we have been invited to a small champagne ‘house’ to see the whole production from grape picking to drinking. I’ll let you know how it goes. Many thanks to Little Old Me for this award. z in Norfolk because she manages to take ordinary, everyday incidents and make them into interesting and amusing posts. She has the knack of reminding you of your own past, or likes and dislikes and so is a great source of food for thought. Canisfamiliaris – a most enjoyable diary about training an adorable Bedlington terrier called Beattie. She has completely transformed her owner’s life and it is a real pleasure to read about their adventures together. They often go walking in the Lake District and Beattie is clocking up a goodly number of Wainwright’s walks. However, the latest post is on a different subject which strikes dangerously close to home in my present state of health!! Lorraine at Meandthecat – because, despite the title of her blog she has only recently acquired an actual cat: a lively little number called Snickers who is obviously going to be thoroughly spoiled (as all cats should be). 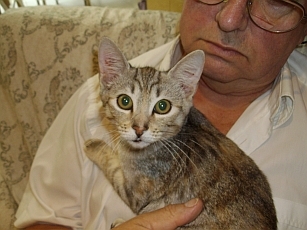 And I’m going to squeeze in one more ‘Cat’ award to Caturday because this blog is packed full of photos and stories about ‘rescued’ cats who go and live in the cat hotel until they find new homes. If I lived nearer you can bet I’d have 77 cats instead of just seven – so it’s probably a good thing that all those loveable, furry felines are inaccessible to me. Most people regard me as paranoid over our family of cats in that I won’t let them out of the front door and even their forays into the back garden are ‘rationed’ because I get worried that they may stray towards the road via the neighbouring gardens or, worse, fall victim to poisoning. After months of poring over the internet I tracked down some deer fencing and ordered it from England and it is now sitting – or rather standing – in the hallway waiting for someone to erect it. But who can we find to do it? Bear is certainly not capable: Jay is not at all practical and wouldn’t have a clue where to start: Pascal is not reliable and it could take weeks: but no-one seems to be able to recommend a good handyman. My neighbour asked two chaps in the village but one was off on holiday and the other ‘didn’t have time’. However, he did say he knew someone who could do it and was looking for jobs. The problem is he lives some way away. All the same, he offered to bring this man round to see us but didn’t say when. It appears they turned up unannounced at five o’clock today when Bear and I had slipped out to the market in the next village. CC and Jay were upstairs and didn’t hear the bell! I have asked them to give a ring next time to make sure we’re home. Then there was the problem of finding a home hairdresser. We thought we were settled with young Marie who set up in business last year. She would come and cut or colour my hair and trim the men’s every so often and we were all quite happy with her. Fair enough, but she might have forewarned her ‘regular’ customers. She didn’t even bother to say sorry that she couldn’t come any more. I learned from Yvette that she had stopped because she had had problems with certain male clients, other people had dirty homes and the final straw was a woman who lived 20 kilometres away and Marie arrived to find that she only wanted a blow-dry for which she paid 10 euros. However, the ‘trial’ at the salon may not be such a wonderful idea as it seems she is expected to work 10 hours without pay and then wait on their decision. All the same, I badly needed a haircut but didn’t feel inclined to return to the local salon after deserting it in favour of Marie. It meant looking through the Pages Jaunes (Yellow Pages) to find the nearest Coiffeuse a Domicile. A young voice answered and the appoinment was made for this afternoon. Virginie turned up with a small bag of equipment and a handbag bedecked with three badges stating “I love boys”, “I love drugs” and “I love beer”. As I greeted her I noticed she had a ring though her lip and another in her nose. My first impressions were unfair because she cut my hair very well and even Bear said he felt ‘comfortable’ with his trim. In fact, she cut round his ears better than Marie did AND she bravely tackled the long hairs inside his ears. It transpired that she had moved from the village named in the telephone directory and she had actually come from Sedan – about 25 minutes away – but she didn’t seem to mind and she charged less than Marie. Let’s hope we can keep this hairdresser. If we could also find a reliable handyman, that would be the icing on the cake. Here she is making friends with a plant. We decided to take her for a check-up yesterday and the vet cleaned out her ears and gave us some thick ‘drops’ to apply once a day until the problem clears up. She cut her nails so that she won’t do herself damage when she scratches, and, anyway, the itching should stop when the medication takes effect. At present, the effects of her shortened claws means that she hasn’t got such a strong grip when she climbs on the furniture and her first attempts to leap onto the armchair resulted in her slipping down again with a very surprised expression on her little face. She was microchipped – they call it a puce (flea) electronique in French – and vaccinated (which she resisted) and then given a thorough inspection before being weighed. There was no sign of fleas but the vet recommended applying Advocate against fleas, worms and earmites for the next three months. She also said that she thought she was fat! We came away 137 euros worse off but, at least, Willow had passed her medical. The other cats are becoming less wary of their new little ‘sister’ and now, Toby, Holly and the twins are more than ready to hiss and snarl back at her or even give her a little smack. Holly started to prowl after her, ready to pounce last night and so we felt it would be safer to put Willow in the conservatory for her own safety during the night. After a few minutes she was scrabbling at the door to come into the lounge so it was Holly who was put into ‘solitary’ to keep the peace. Willow slept on an armchair in the lounge, Mustard, Pepper, Chloe and Toby slept on our bed and Parsley took up her position on Whale’s bed. There were no altercations during the night but I slept badly because the cats made me hot and uncomfortable but I didn’t have the heart to shove them off. Willow has been exploring her surroundings again today and discovered that leaves come off plants and make interesting toys. She has decided that she likes her water from a glass (as do all the others) but hers has to be in the kitchen. My neighbour brought me a couple of small marrows in a bag but when I left them on the table young Willow went to investigate and rolled one of them onto the floor. She has knocked down a pile of books and nibbled a page of the telephone directory (which I left open). At the moment she has fallen asleep curled up on my favourite armchair but I have a feeling she may be dreaming up some more mischief to get up to when she wakes. It seemed like an ordinary day until the phone rang. It was a friend of CC’s. She wondered if we’d be prepared to take on another cat as a friend of her’s was going to Paris and wasn’t allowed to take her kitten. I could hear the girl crying in the background. She was very upset about parting from her little furry friend. And she was leaving today. OK, so I know I’d said never again, six were enough etc. etc. but how could anyone say no? So after lunch Jay took me into town and we went to see the new family member. I hadn’t asked whether she was male or female, or what colour. All I knew was that she was four months old. Jay and I fell in love with her at first sight. She was still in her catbasket as CC’s friend is a bit scared of cats, and she was indignantly trying to get out. 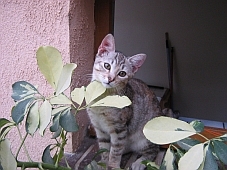 She was far prettier than I’d hoped and she was tabby – my favourite! Of course, we released her and had a cuddle before bringing her home. She’s a feisty little thing. All the other cats have come up to sniff curiously but she spits back at them, despite her size. She has her own litter tray and won’t let any of the others near it. She has eaten some cold turkey, some cheese and pinched some fish from Bear’s plate. Now she’s tucking into her ‘proper’ food. I get the impression she feels at home already but we’ll have to make sure the other cats get extra attention so their noses aren’t put out of joint. Her name was Sissy but I think she’s going to be called Willow now.